Port Grimaud was designed as a village with its main place. This apartment is located in the center of the "Cité Lacustre" which will allow you to be close to the facilities and the beach. Enter this flat and enjoy the Venitian architecture with its columns and wooden beams in the living-room. The kitchen that is now separate could be opened so that it would make a very spacious double-oriented living-room. In the sleeping area, 3 bedrooms -including 2 with a view on the canal-, 1 bathroom and separate toilets. The loggia has a gorgeous view on the canal and the sea far away. A 7m x 3m mooring close to the apartment. 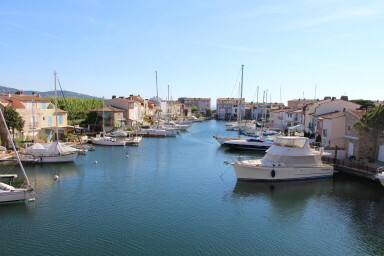 An apartment perfect for Port Grimaud lovers!